Cut the chicken in 1-inch cubes. Heat the oil in a frying pan and fry the chicken until lightly golden-brown. Add the onion and garlic, stirring until soft. Incorporate the jalapeño, chicken broth, chopped cilantro and lemon zest and juice. Season with salt and pepper, to taste. Cover and cook over medium heat for 10 minutes or until the chicken is cooked. Add the cooked rice, stirring well, and incorporate the corn and beans. Reduce heat to low and let cook for 10 minutes until the mix is hot. Garnish with more chopped cilantro and serve immediately. For an even more intense flavor, marinate the chicken with garlic and the juice and zest of half a lemon before cooking. If you don’t have black beans, use red or pinto beans. How many times have you arrived home at the end of a long work day, tired and stressed, with little desire to eat? 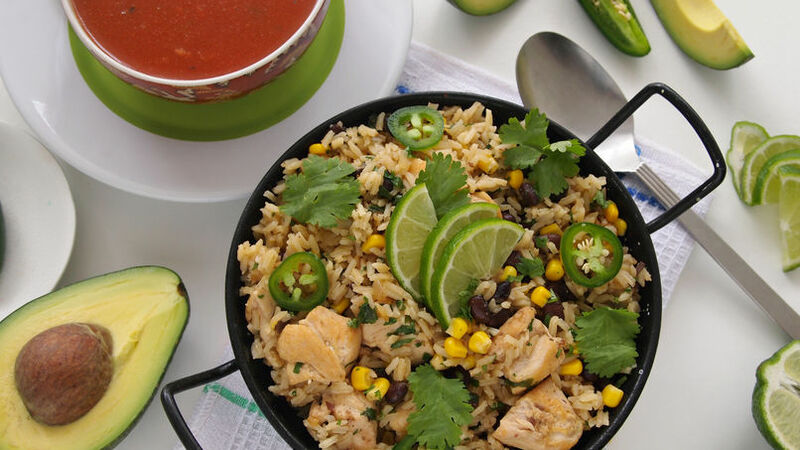 The next time this happens to you, I recommend doing a quick scan of your refrigerator and preparing something simple, using just one pan, such as this delicious rice with lemon chicken, cilantro and black beans. It’s a tasty, filling and energizing dish. Your whole family will love it! Best of all, you won’t dirty more than one pan, which you can also bring to the table. How practical! I like to bring more chili peppers, avocado and sliced lemon wedges to the table so that everyone can garnish their own dish and add what they like most. Pair this yummy recipe with a big, steamy bowl of creamy Progresso™ Tomato Basil soup. The combination is marvelous!